I love yams in any form: baked, cooked, in a soup, roasted, or as a purée. The natural sweetness is divine, and if we add all the health benefits of it, then it is even more attractive to cook with. 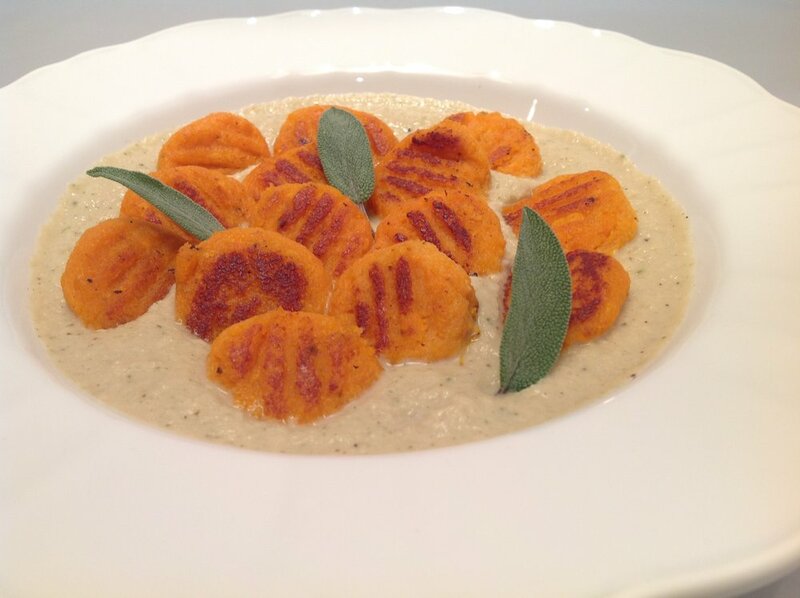 I created a vegan version of gnocchi using yams, and it's good! Along with a creamy almond sauce, it is heaven! Also, it is pretty easy to make. In a bowl add all the ingredients and mix thoroughly. Cool in the refrigerator for an hour. Take a round spoon and use it as a measuring tool to create evenly sized gnocchi. Dip the spoon in a cup of water to prevent sticking, and scoop some dough into your hands. Keep your hands wet too, so the dough will not stick. Form a little ball, lay it on a surface and press with a wet fork to create an indentation. Bring a large pot with salty water to a boil. Very gently scoop the gnocchi and cook in the boiling water. As soon as the gnocchi start to float, use a small colander and remove them from the water to a plate. Make sure you don't put one on top of the other (they might stick to each other). Next- heat 1-2 tablespoon olive oil in a non stick pan, add the sage leaves and the gnocchi in batches, don't over croud the pan, and be very gentle not to break the gnocchi. Sauté on each side just until golden--it happens pretty quickly. Set aside. In a non stick pan add olive oil, onion, garlic, salt and pepper. Sauté the onions until tender. In a food processor add almonds, sautéed onions, vegetable base, water, salt, pepper, and the sage leaves from the gnocchi. (those that you sautéed with the gnocchi before). Pour the sauce back to the pan and heat it up. Just before serving, pour the sauce into a plate, add the gnocchi on top, garnish with fresh sage leaves, and enjoy.